Blizzard's Kabookie ski was one of two new Alpine Touring standouts I found at the 2012 SIA show—the other being Garmont's Cosmos boot. Like the Cosmos, the big news with the Kabookie is its ability to bring the performance and especially the 'feel' of your favorite Alpine rig into the backcountry. On my scale, the Kabookie weighs eight pounds, four ounces per pair (173cm). In general I think of eight pounds as my touring limit, but if you compare the hard snow performance of the Kabookie to a great touring ski like Volkls' eight-pound Nunataq, you'll quickly realize those four ounces are the cheapest you'll ever carry. The Kabookie's ride is highly reminiscent of Blizzard's superstar All-Mountain Cochise, including that magical Big GS feel you get when you rocket across the fall line at high speed. In fact, the Kabookie is very simply the first touring ski I've ever ridden that kept me not just satisfied but actually happy in-bounds. To be fair, given a choice between the Kabookie and the Cochise in-bounds, I would absolutely pick the Cochise (although the Kabookie is a little quicker edge-to-edge). But when I did ride my Kabookie-Cosmos-Dynafit rig at Mammoth, I never felt like I was squandering the day. The ski felt completely credible all the way up to speeds around 40-50mph. Out of bounds, I found the Kabookie to be nothing less than a dream. Really, I felt like I was bringing my Alpine rig into the backcountry. Every time we reached a summit last season, I just got this huge grin on my face—it was as if I'd had my Alpine skis and boots delivered to the top of the hill for me. I've never had so much fun skiing in the backcountry. I've never felt so solid on my skis. Compared to the Cochise, I find the Kabookie a little snappier in short-radius turns. It's a good steep-skiing plank, with a slightly-rockered tail that releases very cleanly from the hill. 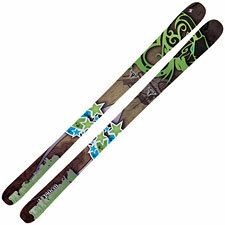 As the snow hardens or speed increases, the Cochise asserts its authority, with a more secure and positive grip. As a touring-class ski, however, the Kabookie's hard snow performance is impressive. Both Kabookie and Cochise deliver a near-perfect fusion of rocker and camber that in the end is more than just the sum of its parts. As for soft-snow performance—it's good. The Kabookie's width underfoot (98mm) puts it solidly in the generalist category, so on deep days it will be outclassed by fatter powder specialists (as will the Cochise). That said, the all-around versatility of the Kabookie will keep you happy on powder days, and happier still when you find yourself on the typically variable and challenging snow found on most backcountry tours. Conceptually, I was sold on the Kabookie as soon as I tried the Cochise. If you think of the Kabookie as the touring version of the Cochise, you are getting a remarkable amount of the Cochise's fit and feel at a very credible weight. Put a pair of Dynafits on them, and you can go well beyond sidecountry objectives, knowing the ski will dazzle you on the downhill. Highly recommended.